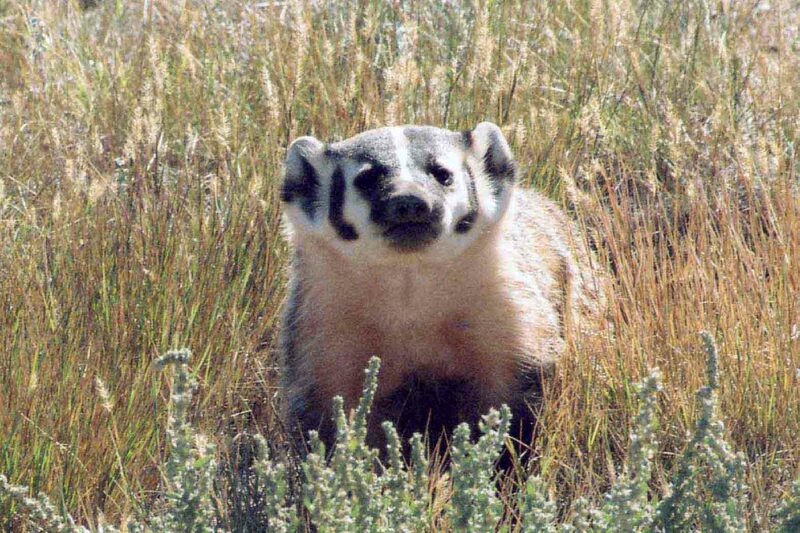 I am starting this page with my favorite critter in Wyoming--the badger. Okay, badgers aren't really cute and cuddly, but they are a part of the overall ecosystem and while I don't consider them cuddly, I do think they are cute! According to my research, badgers are basically solitary animals. 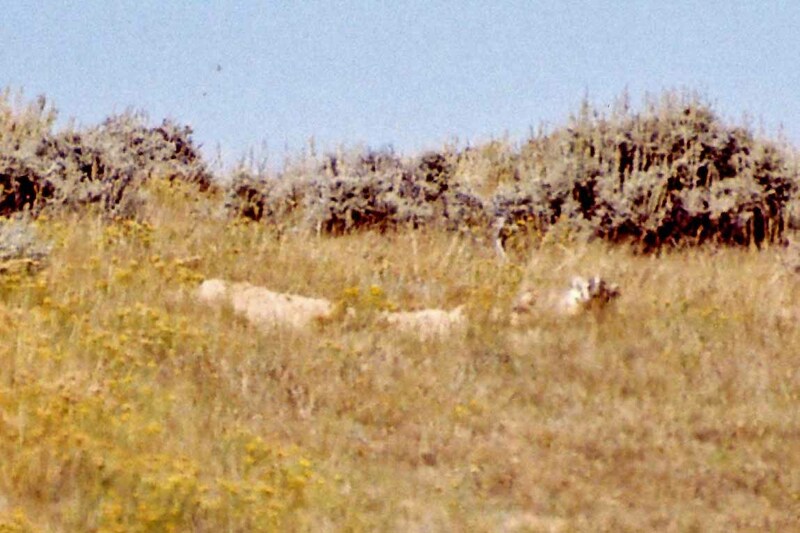 They inhabit open grasslands and pastures. One source listed population density at five animals per kilometer. 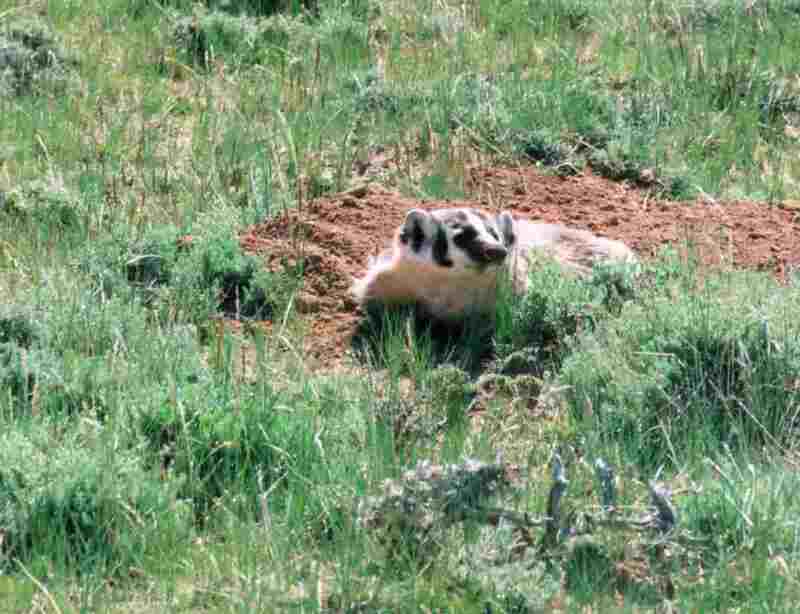 Badgers dig numerous burrows and also dig for prairie dogs and ground squirrels. 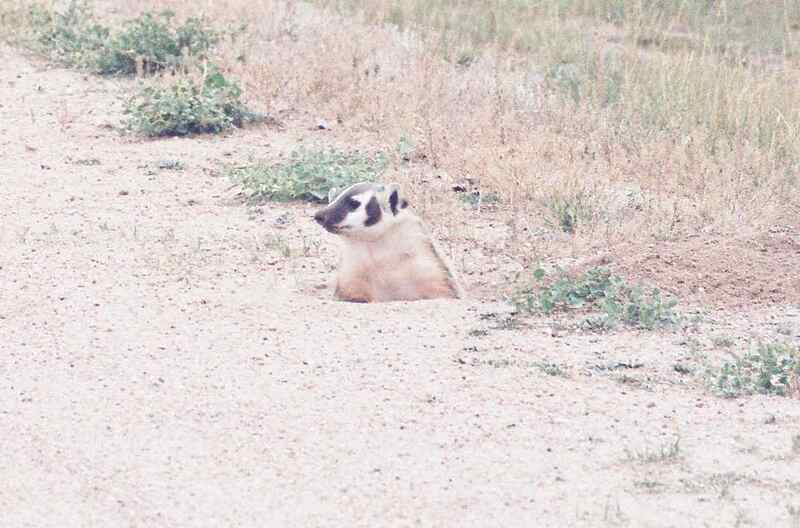 Digging may be the number one activity of a badger. 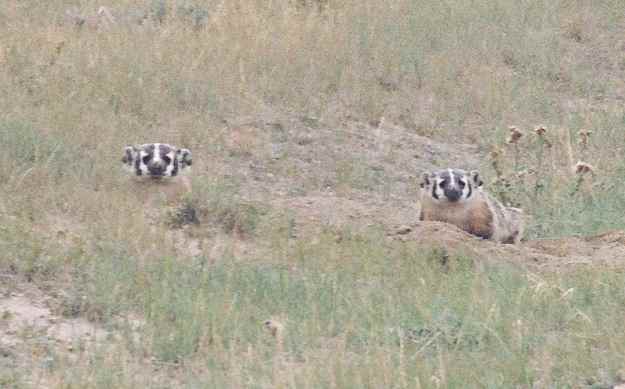 Of the badgers I have observed at the ranch, one was simply sitting at the entrance to it's burrow, two were mating and the remainder were digging holes. Their sharp claws and stout forearms allow them to dig very quickly. One source said multiple humans with shovels could not dig as quickly as a badger. uses have declined with the advent of synthetic fibers. species of badgers throughout the world. The skin on a badger looks very loose. It is colored mostly white and black, with some browns or even reddish. I have seen several variations. The badger appears to be quite slow and almost clumsy when running or walking. It almost "waddles". This is quite deceptive as the badger can actually cover a lot of territory very quickly. Once the badger starts running, I generally abandon all hope of getting a photograph! 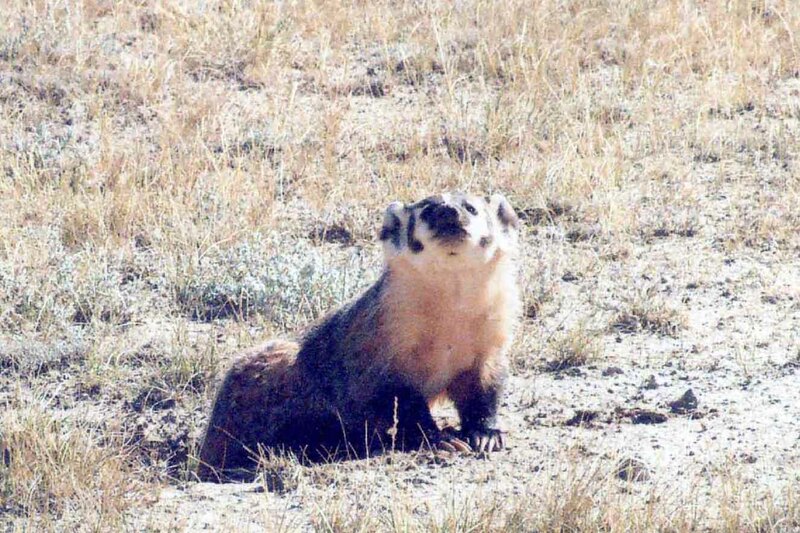 Badgers consume ground squirrels and prairie dogs, which is beneficial for humans since these rodents carry disease. 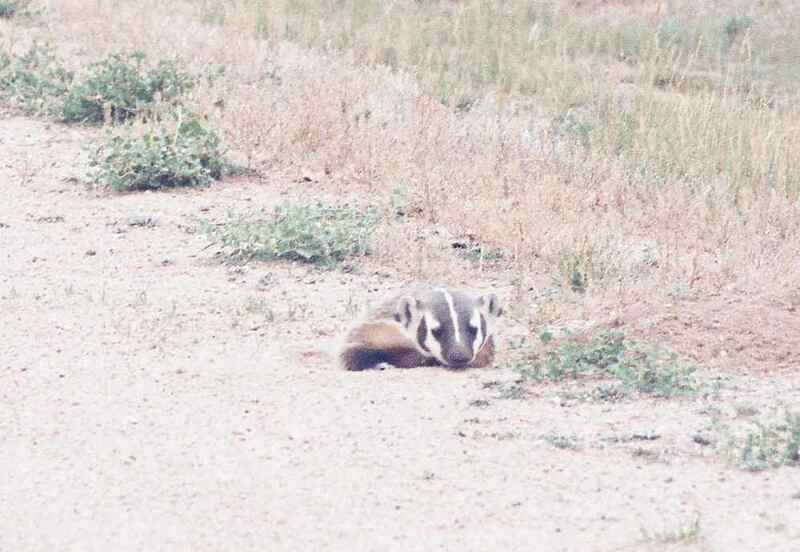 I have also seen a nature show were badgers were eating bull snakes. Badgers may also take rabbits, birds, etc. 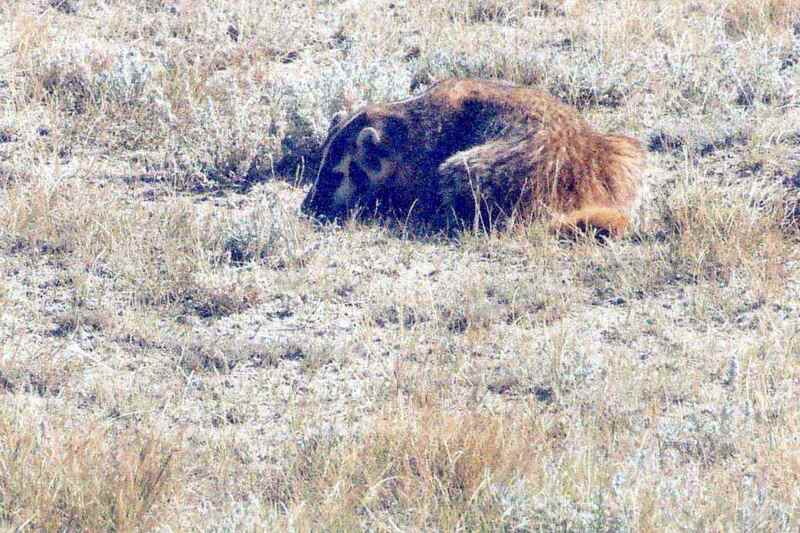 Badger litters are born in the early spring (March and April, which is often still wet and cold in Wyoming). They are born in a burrow and are blind at birth and helpless. The female cares for the babies, which are weaned in 5 or 6 week and their eyes have opened. The young leave the mother and set out on their own at 5 or 6 months. Badgers size varies greatly. Measurements I found for length range from 20 1/2 to 34 1/2 inches (31 average for males, 28.7 for females). Weight ranged from nearly 9 lbs to 26 lbs. Size may depend on food availability, climate, genetics, etc. Most badgers I have seen I would estimate at around 28 to 30 inches. I have no way to estimate weight so I defer to the information provided by others! My photos of badgers are taken using a telephoto lens and shooting without a tripod. Any badgers you see in the wild will hopefully be a a fair distance away. While I have not seen aggressive behavior on the part of the badgers I have photographed, I always give them plenty of "personal space" and be careful not to corner them. Badgers are an important part of the ecosystem and hopefully people will try to work around the badgers. I am not sure "peaceful coexistance" is what one would have with badgers--more like "mutual tolerance" with the humans adapting to the badgers! So let's adapt well! 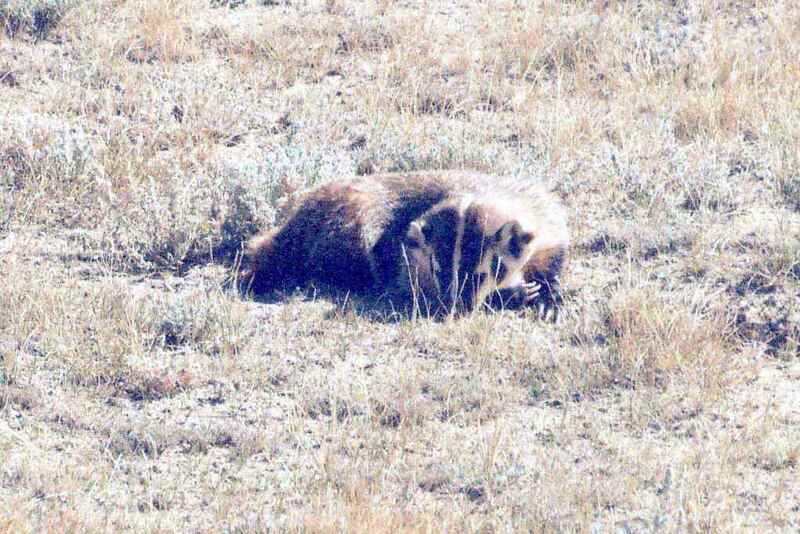 Just type "badger" into your favorite search engine and see what you can learn about badgers. The weekend of September 13th was a great weekend for badger viewing! We saw six of the critters, and one walked up to within 30 feet of me! I think badgers have definitely been getting a bad wrap about the ferocious behavior. 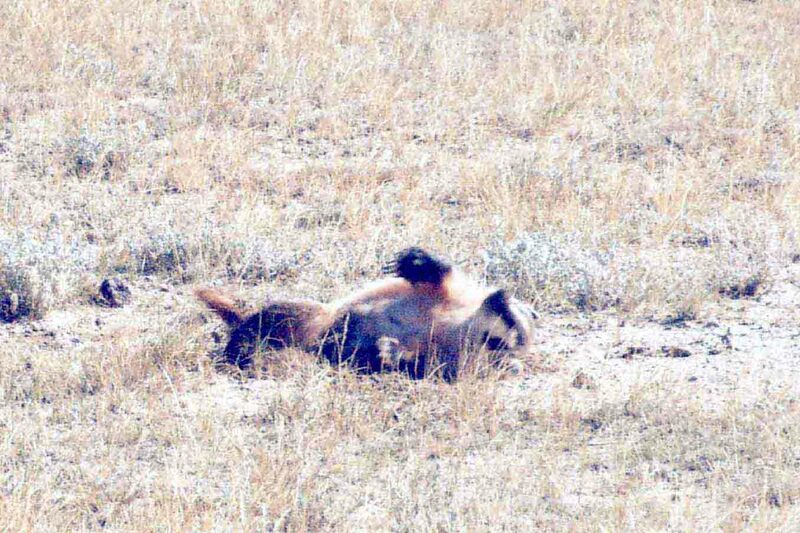 The first badger I saw walked up very close, rolled on it's back, hissed at me a bit (or I think it was a hiss--the wind was blowing too much to actually hear much) dug in the dirt, both in its burrow and with its nose in the dirt, etc, etc. I stood and watched for almost 20 minutes. I went back to the car (parked a ways up the road) twice and got more film and a digital camera. In the end, the badger just stopped showing any interest in me and went down his burrow. It was the most fascinating thing to watch. The badger showed no aggression. Another of the badgers was on the hill directly out the front door of our cabin. He was too far away to photograph well, but I watched him for about two hours. He was sleeping on the dirt hill next to the burrow. Twice, he wandered off and then came back and napped more. He appeared totally calm--I did not try walking toward him because I could see him well through the binoculars and did not want to disturb him. 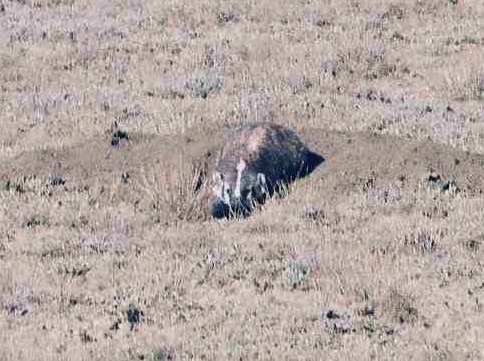 Never would I have imagined a badger would sleep out in the open at two or so in the afternoon. Yes, he was by the burrow and could disappear at any hint of danger. Yet, much of the beliefs and information about badgers never even hints at the daytime behavior and the lack of fear that I have observed. My observations of badgers are made in an area with a very small human population. I would guess that the presence of humans changes the behavior. 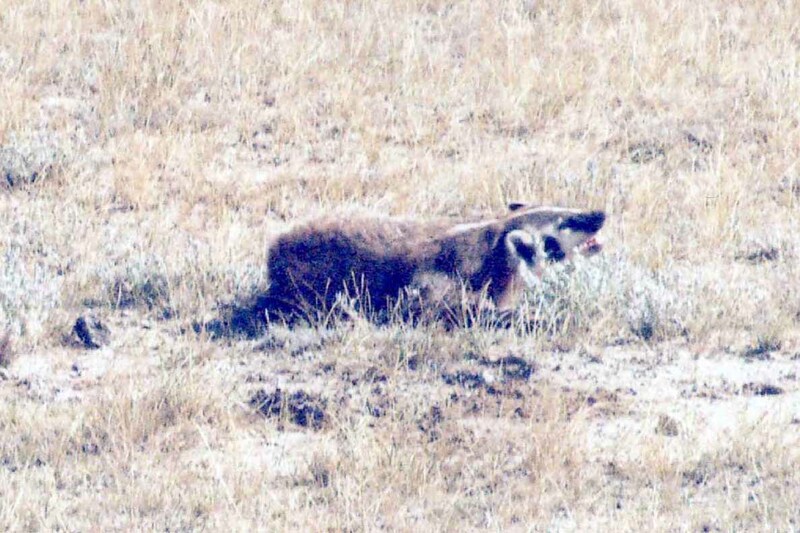 Interestingly, a few weeks back in our newspaper, there was a picture of a badger and a house cat having a face-off in the back yard of a home on the edge of town. The caption said the badger eventually just left. Badgers obviously can live around humans and do so. Seeing them in an undisturbed area, though, shows a truly unique side to their behaviors. 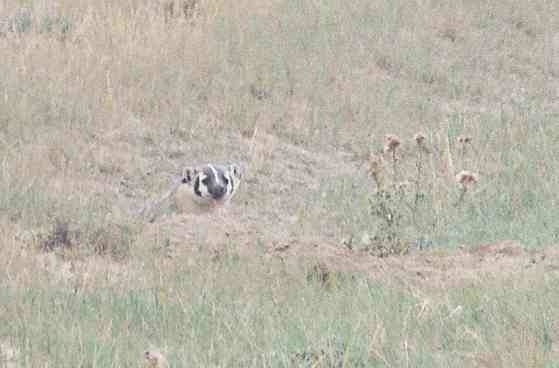 This is the badger living near our cabin.